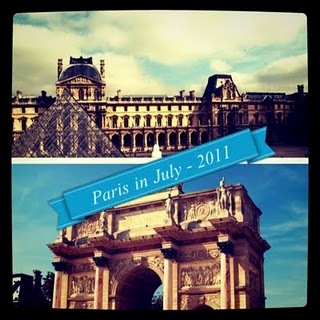 That’s Paris in July, hosted for a second year by Karen at Book Bath and Tamara at Thyme for Tea. A celebration of the French capital, taking in books, cinema, music, food … and I’m also thinking about a little knitting. I have never read any Balzac, but I had to order Cousin Bette from the library when I read Lyn’s wonderful review. And then there’s Dumas and The Count of Monte Cristo. I’ve been slowly working my way through this vast and wonderful tale, and I am sure July will see a little more progress. There are some wonderful classics from the 20th century. I read Gigi by Colette for Paris in July last year, but I didn’t get to the second novella that came with it in my edition. So The Cat is a definite possibility for this year. 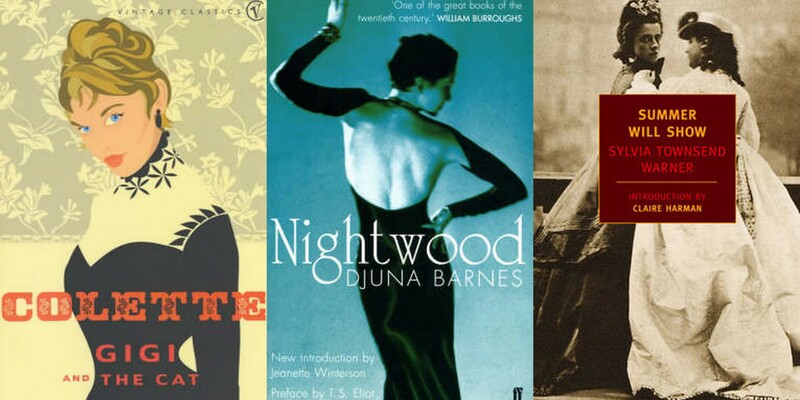 Nightwood by Djuna Barnes is another book I lined up last year but didn’t get to. So I’m lining it up again. Tracy mentioned Summer Will Show by Sylvia Townsend Warner, and so I pulled out my copy. It does look interesting, but I’m not sure. I tend to think that STW is not as good at novels as she is at short stories. But I’d be happy to proved wrong. I have a few historical novels from the lovely Gallic Books to hand too. There’s The Châtelet Apprentice by Jean François Parot – crime at the carnival in 18th century Paris. it looks wonderful, and the library has the next book in the series, so I should really read that one before the next one disappears from the shelves. 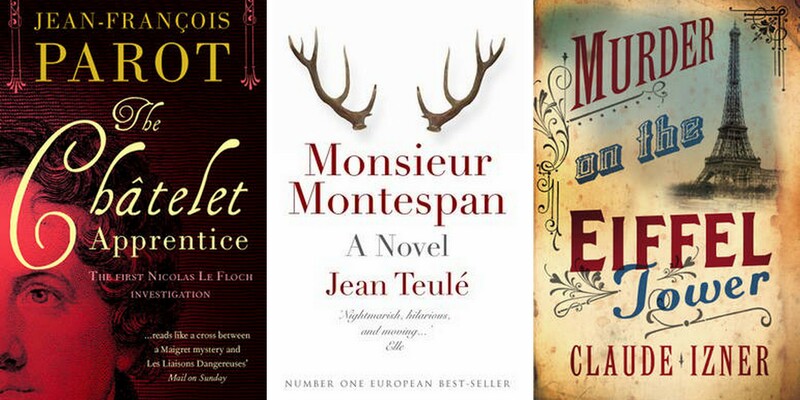 I have already started Monsieur Montespan by Jean Teulé, that story of the cuckolded husband of Louis XIV’s mistress. I had to put it to one side to catch up with library books and the Crime Fiction Alphabet, but I am eager to pick up the threads of the story again. I have two books sitting on the dining table, where I keep books that are at the top of my list of priorities. 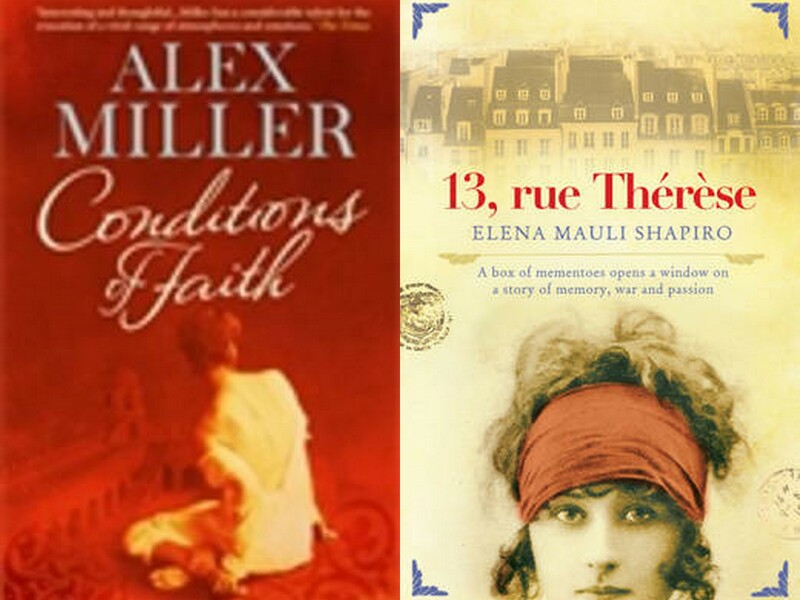 Conditions of Faith by Alex Miller won awards when it was published ten years ago, and it is being reissued on 1st July. I have only read the first page, but I am already beginning to understand why. I have read much praise for 13, rue Théresè by Elena Mauli Shapiro, a story inspired by being left in possession of a box of mementoes whose owner had died, and I love the concept. And I must find time for some non fiction. I have two books waiting on my own shelves, and one that I picked up from the library today. Liberty by Lucy Moore tells the story of four women caught up in the French Revolution. 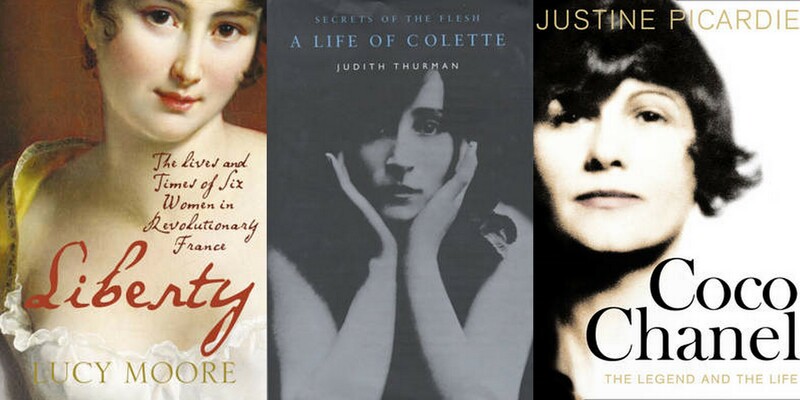 When I remembered The Cat I also remembered that I had a copy of Judith Flanders‘ acclaimed biography of Colette. And I will definitely be reading Coco Chanel by Justine Picardie. I was intrigued by the extracts published in The Telegraph a while back, and I was thrilled to spot this one in the library this morning. You have mentioned so many good books that I wouldn’t even know where to start! I’m not too sure either, hence the groupings to try and keep track and make sure I read a good mix of books! Wow what an enticing post – fantastic choices and pictures, I can’t wait to see what you pick and I love the idea of the Coco Chanel. I am really going to try and read Summer Will Show as I keep coming back to it, although I haven’t read anything by Sylvia Townsend Warner before so I was interested in your thoughts on her. Happy reading, listening, watching, eating and knitting – lots of fun! Marvellous list! I’m in the process of putting my list post together and it’s so difficult. I have the Alex Miller and Coco Chanel lined up too ……..and so many others . I’m even toying with the idea of listening to my first ever audiobook – Perfume by Patrick Suskind. Going to be a fun month! I loved Perfume, and with the right reader it would work beautifully as an audiobook. Enjoy! I heard that 13, rue Théresè has clues you have to look up on an iPhone or something, and decided I was too old to appreciate it. I’m interested to hear what you have to say about it. And I LOVE that cover of The Count of Monte Cristo…want! No sign of needing an iphone in my edition of 13, rue Théresè, but there is a website http://www.13ruetherese.com . I donlt have that cover of The Count of Monte Cristo, but it was too good not to use. Some of the new Vintage covers have me wanting to buy book I know I already own! These all sound great! I’m not completely sure what I’m reading yet, but I know one will definitely be My Life in France by Julia Child. I’m looking forward to July! What a great choice – I’m tempted to see if my library has a copy. It’s amazing how many possibilities there are when you start looking. I’m spoiled for choice. I have a huge stack of possible reads for Paris in July! 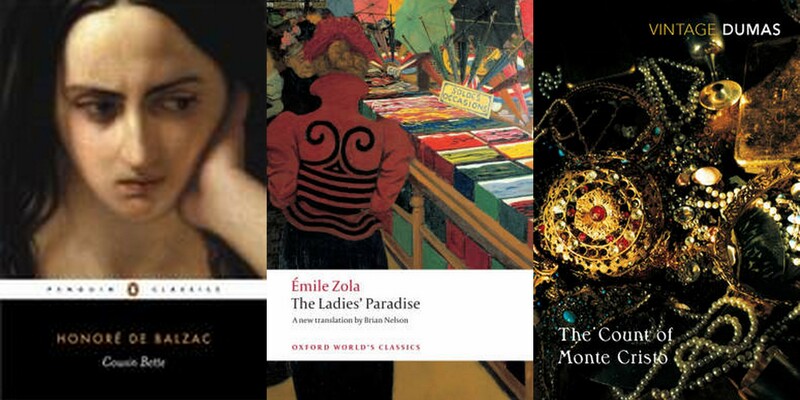 I’m going to have a hard time deciding, but I’m definitely reading at least one by Zola (Germinal), and I’m very intrigued by The Ladies’ Paradise. I also have The Dud Avocado by Elaine Dundy and My Life in France by Julia Child. In fact, I think I have enough for an entire post on the subject. Must get to work! Zola is definitely calling. And I’ve had a look in the library and found some more wonderful history books and picked up my classics for the month. What terrific choices! You make me want to make a longer list! I’m not sure how many books I’ll get to, but it’s good to have a choice. And I would say you could count whichever Colette takes your fancy – her spirit is definitely Parisienne! So many suggestions! I think I’m going to join in with Summer Will Show, which I bought in Paris over a year ago. I’ve only read two of STW’s novels, and none of her short stories (although I do have a lot of them) – so I’m encouraged to hear that they’re even better than her novels! Any collection in particular that you’d recommend? I haven’t read too many STW short stories, but I loved A Garland of Straw, and the Virago collected short stories is definitelyworth picking up. But go with whatever you can find – STW has the art! Thanks! I have One Thing After Another (or similar title) and The Music at Long Verney. I’ve also just been reading her letters with William Maxwell – absolutely brilliant. Oh, p.s., my favourite Parisian book is Piano Shop on the Left Bank by Thad Carhart. Not a book I know, but I will check the library catalogue. It’s non-fic I think, though reads like a novel, mostly about pianos – made me love pianos, which 10 years of learning the piano did not! Just reading through this post has me all excited..I love reading vicariously through you!!!!! Glad to be of service Staci! Thank you for linking to my review of Cousin Bette, it’s such a wonderful novel with that very cynical view of love & relationships that Balzac & Zola are so good at. I read Therese Raquin many years ago & I would love to reread it. It’s an absorbing book with some really shocking scenes. Have fun with your vicarious visit to Paris! I didn’t get along well with Count of Monte Cristo or The Ladies’ Paradise, but I very much enjoyed Cousin Bette! Need to read more Balzac!